Koyama Press has recently entered into the world of kid’s comics with two spectacularly different books – the hardcover A Cat Named Tim and Other Stories by John Martz is described as a picture book for younger readers, while the softcover Cat Dad, King of the Goblins by Britt Wilson could certainly be either a fun bed-time storybook or something you set a slightly older reader on for fun or during a long car ride. Cat Dad, King of the Goblinsis a story of two girls Luey and Miri and their friend, a giant frog named Phil. The trio is doing homework, drawing, and basically minding its own business when a bright white cat jumps on the kitchen table – soon they find out that their mom has accidentally transformed their dad into that cat, and he’s escaped into the magical confines of the linen closet. What follows is a raucous and silly adventure. 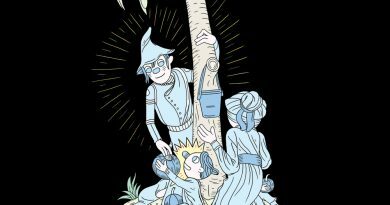 First and foremost, Cat Dad, King of the Goblins is a comic of frenetic energy. 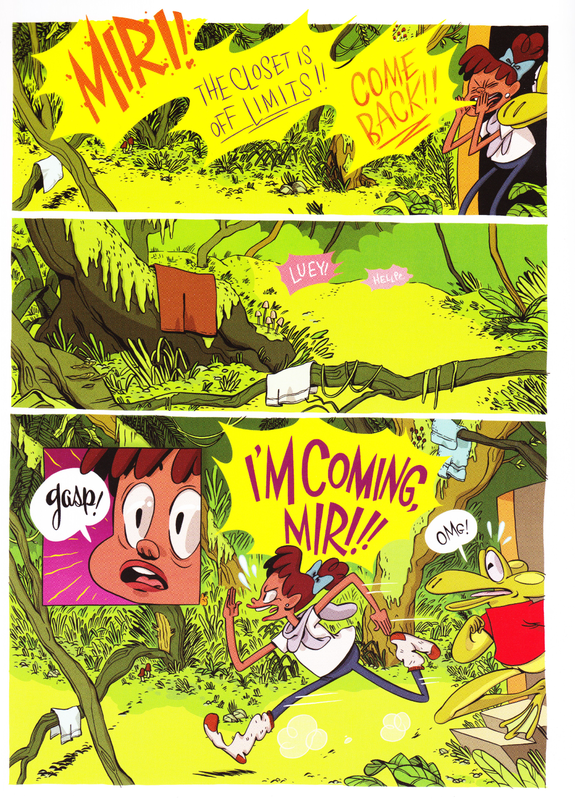 Britt Wilson’s loose illustration style lends itself well to a script that is dynamic and fluid. As soon as the cat is on the run, the rest of the book is one giant race to the finish, as the girls and Phil track down their cat Dad and bring him home, and while a interceding group of goblins try to keep Dad stuck in the linen closet. But while the book is racing towards its inevitable conclusion, Wilson’s artwork asks your linger on the page. The colors are absolutely astounding, and the detail of the environments in Cat Dad, King of the Goblins is spectacular for a comic paced this way. Clearly there’s a bit of a push and pull here, but Wilson will let you sit on a panel or two provided you jump right back in and get running again. Wilson also has a great sense of situational humor. 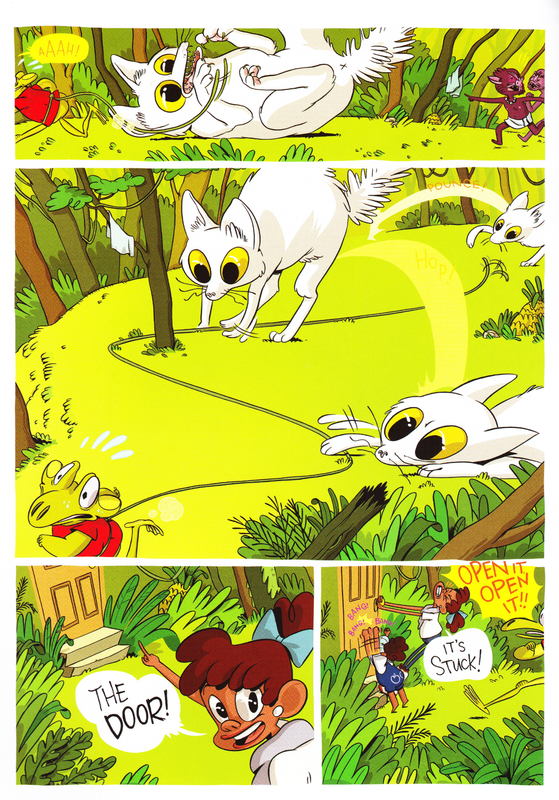 While there aren’t punchlines as such, there are a lot of fun visual things that Wilson is doing with this comic, from cat antics to using a cootie catcher to figure out which tunnel to walk down. I absolutely adored the banner for The Distraction that I’ve pulled from the comic. It is touches like these that make the comic a lot of fun to read. 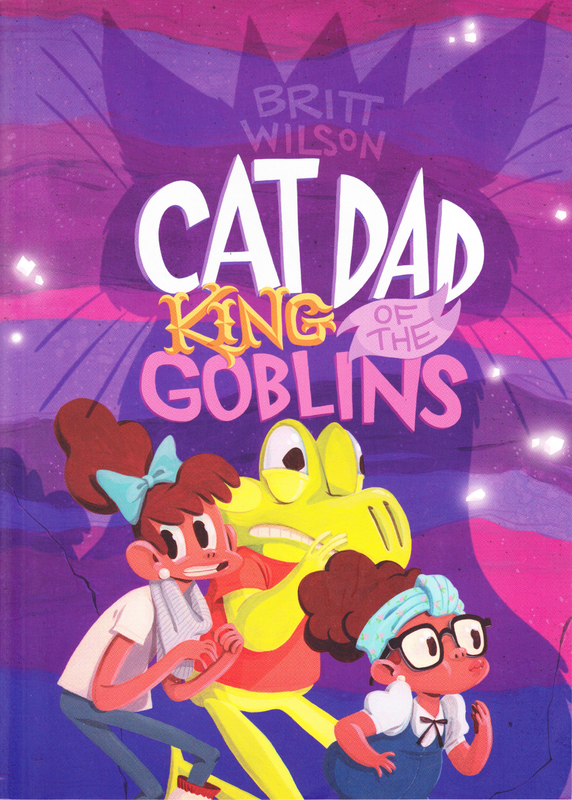 Cat Dad, King of the Goblins is a story the kids are going to want to read again and again. With its strong narrative, great characters, beautiful art, and blisteringly fast pacing, its only flaw is that it ends. Recommended. Britt Wilson is an illustrator and cartoonist. You can find more of Wilson’s work at tumblr: brittwilson. koyamapress is a publisher of alternative comics. Read more about their Fall 2014 lineup at their website.